The lathe grooving operation is designed for the machining of the grooves or other zones that can not be made by other way. The predominant cutting direction of the groove tools is a radial motion inside part. The cutting by the left or right tool side must be excluded or minimized. 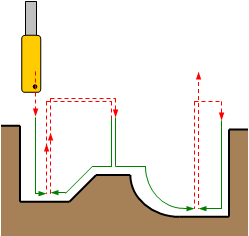 The tool path of the grooving operation considers this specific feature of the tool. So the tool path is a series of the strokes that are parallel to the main machining direction. These rough strokes remove the sizeable volume of the workpiece. The further workpiece shaping is performed by finishing strokes. The finishing strokes consider the specific tool feature also. These strokes remove the scallops after the rough strokes. So the roughing and finishing strategies are combine in one operation. It is possible to use these strategies independently by setting the field <Groove machining type> to the position: <Rough passes only>, <Finish passes only> or <Rough and Finish passes>. The Job assignment for the Lathe grooving is a curve segment that can be defined by <Groove>, by <Curve segment> or by <Two points>. It is possible to define a few segments in a one operation. The machining sequence depends on the sequence in the Job assignment list. In the <Rough and Finish passes> mode the check box <Rough passes for all grooves first> is accessible. If it is checked then the rough strokes will be performed for all segments before. After that the finish passes will be performed for all grooves. 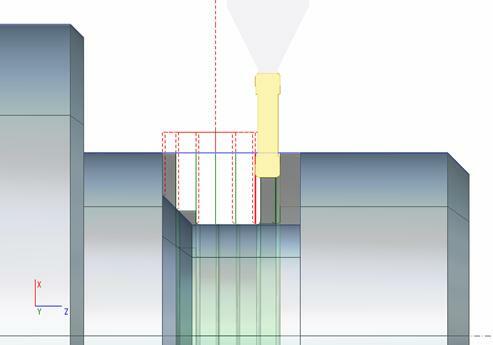 If the check box is unchecked then the rough and finish passes will be performed for the first groove, after that the rough and finish passes will be performed for the second groove and so on. <Machining direction> parameter defines the stroke sequence of the rough passes. <Machining direction> can take the next values: <Bidirectional>, <Alternate>, <Forward>, <Backward>. Rough step defines the distance between the neighbor strokes. The step can be assigned in the length measure, or in the percent of the cutter width. The step can be calculated automatically by the groove width and the strokes count also. It is possible to set the <Back off> distance. The back off distance reduces the probability of the tool and workpiece collision during the tool retraction. The roughing machining can be performed in a few layers. It is necessary if the groove depth too large. The <Multi-layer> strategy is defined on the corresponding panel. It is possible to set the layers count or the layer depth, layer machining direction accordingly to the previous layer. The <Absolute return> type makes the motion to the next stroke via the safe level. The <Incremental return type> makes the motion to the next stroke via the previous level plus clearance. The <Chip breaking> panel defines the parameters of chip breaking. If a chip breaking is enabled then the work stroke is break by return to the clearance level. It is possible to define the break count or continues motion depth. <Dwell time> panel allow to define the delay on the grove bottom or on every return. The basic parameters of the finishing strokes are defined on the panel <Finish step>. The strokes count and the distance between strokes are assigned here. The first finish cut direction may be obligatory CW or arbitrary. The direction of the next finishing strokes depends on the condition to minimize the idle motions. Usually the next finishing stroke is inverse to the current stroke. <Overlap> is used to exclude the unmachined segments on the flat bottom. Overlap defines the distance between the raising points. The axial and radial stocks allow to remain the stock for the next operation.